During December 1642 and January 1643 the Dutch ships Heemskerck and Zeehaen, commanded by Abel Tasman, charted much of New Zealand’s west coast. On December the 19th at least three lives were lost when Maori waka attacked a small Dutch boat in Golden Bay. In 1992, on the 350th anniversary of these events, Golden Bay Museum decided to build a large diorama depicting the attack. Between 1992 and 1998 Robert Jenkin researched and build it, basing the Dutch vessels mostly on reconstructions by Albert Hoving of the Amsterdam Rijksmuseum. 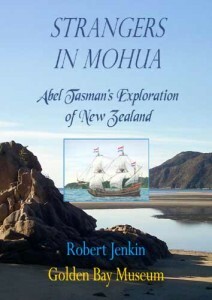 Robert went on to write a book, Strangers in Mohua, concerning Tasman’s exploration of New Zealand, and in particular the sequence of events in Golden Bay. Copies of this may be obtained by emailing Golden Bay Museum here.